Who, where, when: Navy (2-3) at Central Michigan (2-3, 0-2 Mid-American Conference), Friday, 8 p.m.
TV: ESPN2 (Carter Blackburn and Rod Gilmore have the call). Gambling is illegal in most states: Central Michigan is a two-point favorite. 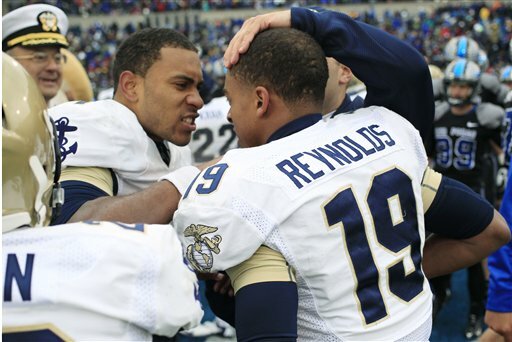 Meet your starter: Freshman Keenan Reynolds takes over quarterbacking duties from junior Trey Miller. Miller was unable to practice Wednesday due to a nagging ankle injury, according to The Washington Post, making head coach Ken Niumatalolo’s decision easier. The Washington Times reports Reynolds will be the first freshman to start for the Mids since Jim Kubiak in 1991. Meet your opponent: Central Michigan has allowed more than 50 points in its last two games, both road losses. It’s allowed at least 31 points in every game so far this season, so wins have come thanks to the offense, led by senior QB Ryan Radcliff (almost 1,300 yards passing, nine touchdowns), junior running back Zurlon Tipton (447 yards, six touchdowns, 6.2 yards per carry) and an experienced (three seniors) offensive line that’s allowed five total sacks over five games. Back to balance: Navy and Air Force engaged in a typical option-offense slugfest last weekend. This week, CMU brings a balanced, high-powered attack well-suited to the “MACtion” nickname. Aside from senior Tra’ves Bush, the Mids have an inexperienced secondary that may struggle to keep up. Read more about the secondary’s challenge here. “MACtion?”: Yes — first definition.